Flowers, trees and grasses are the showiest and most prized elements of a perfect landscape. However, there is another, often overlooked element that is essential to a beautiful and functional outdoor space – hardscapes. Hardscapes include all of the “fixed” elements of a landscape, such as patios, retaining walls, boulders, pavers, walkways, trellises and decorative items. While most people may not give hardscapes much thought, they are extremely important, and can’t be ignored. Hardscapes act as the supportive framework, or “bones” of a landscape. Great hardscapes make great gardens, and without them, you really only have a directionless collection of plants. Hardscapes take on a new importance in winter. In growing seasons, they should blend in seamlessly with and support the existing foliage. However, in colder months, without glossy green leaves, colorful flowers, and continuous movement from the wind to distract the eye, hardscapes take a lead role as the focal point of a garden. If you want to truly enjoy your outdoor space year round, you’ll need to make sure you have a hardscape that is thoughtfully designed to be beautiful all on its own. One thing to focus on in a hardscape is the materials. It’s important to use really high quality materials to ensure that the design is beautiful and enduring. It’s also important to make selections that complement both the architecture of the home and the materials used in it. This helps the outdoor space feel like a natural and organic extension of the home. 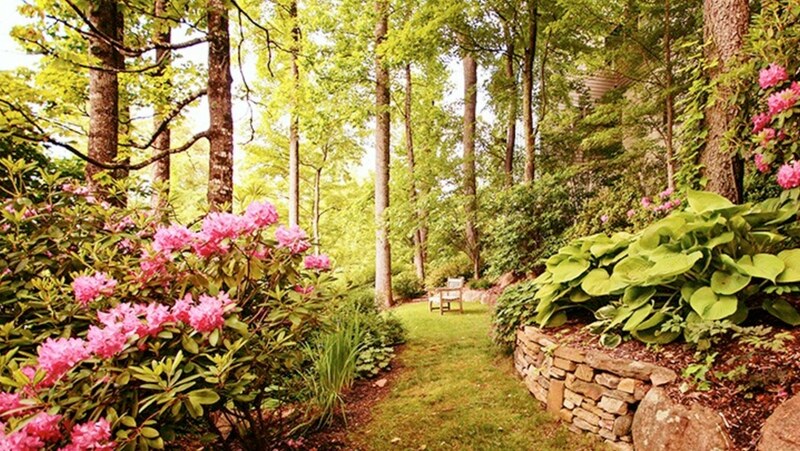 Our goal is always to create a landscape that looks like it belongs, both with the house and with the overall natural setting found in the Blue Ridge Mountain area. There is also artistry to a great hardscape. Everything – benches, fences, walkways – should be strategically placed with balance, proportion, scale and color in mind so that the eye is drawn in and the space feels “right.” There should also be points of interest that take the eye around the landscape and add a bit of a wow factor. And then of course a hardscape has to have function – with the right touch a little winding footpath still beckons in the winter, and a gorgeous patio with an outdoor fireplace can be the perfect place to enjoy the outdoors on winter days. One element we like to add to a hardscape is evergreens. Because they are largely unchanged from season to season, can act as permanent features of a landscape, and a such, can be considered part of the hardscape. Evergreens add a great deal of artistry, drama and color to a winter landscape. They are also interesting and important enough to merit their own post, so we’ll be discussing these beautiful trees and shrubs next in our winter garden blog series. As winter ends, take a look at your outdoor space. This is an ideal time to really see and evaluate your hardscape, if you haven’t before. Does it flow? Does it reflect the style and character of your home? Is it comfortable? Is it beautiful? Does it make you want to linger outdoors? If not, now is a great time to consider changes you’d like to make in the coming warmer months. Next winter, you could be looking at an outdoor space you truly love.